UPDATE: You can now buy a high-res poster of this image here. 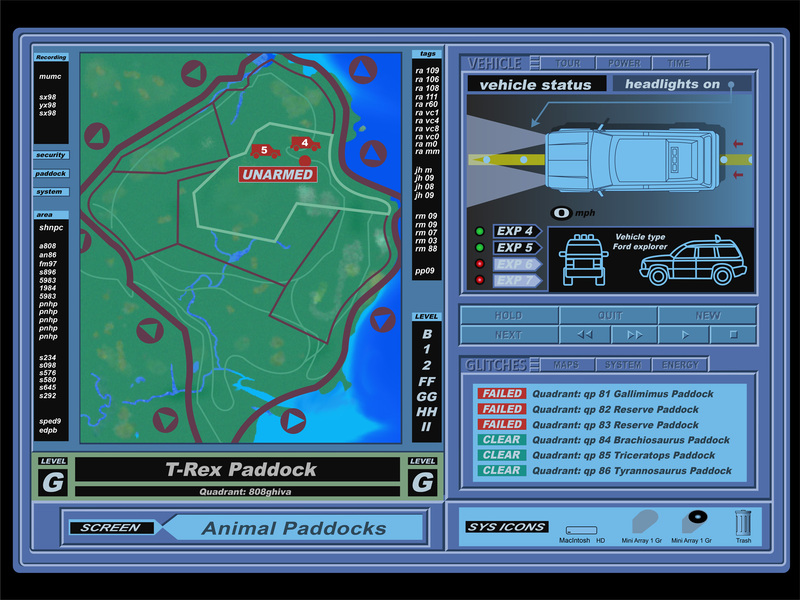 It’s been a while since I’ve done a Jurassic Park post, and even longer since I released a geeky wallpaper (not counting train maps), so this fits the bill nicely. This wallpaper recreates the desktop seen in the first film. Request: If there are any video-savvy folks out there, I was hoping for some help in recreating the animation from the film for a looping YouTube video. I can provide this backdrop, and several overlays (for the alarms). You’d need to scoop the audio and compile the image sequence, and create a lengthy loop (something like this, but not necessarily 10 hours!). Email me if you are interested. I was just going to do a GIF but the alarm beep audio is crucial. UPDATE: Someone has volunteered! Hope to have a looping video for you all to enjoy soon. Also I was pointed to this video as well, check it out. Above is the fullscreen 4:3 ratio, below is the widescreen 16:9 ratio. I have to admire the design of this desktop and its usage in the film. So much information is present, which helped signify a lot was going wrong. You don’t get bogged-down in information overload at all. Genius. For more Jurassic Park posts, click here. These are awesome Dave. Now if we can only get the screensaver with Wayne Knight as Elvis. Thanks Darian! I emailed you. I’m a bit late to the party! It’s now 2019! However the further into it I get, the harder it is to stay faithful to the film’s user interface. I’m also not a fan of the play, stop, rewind buttons – so I’ll probably be swapping some of those with buttons that make more sense. I plan to keep the “hold” button – to toggle the manual pausing of a vehicle. Probably a “return” button to make the cars return back to the visitor center without pausing at the paddocks. 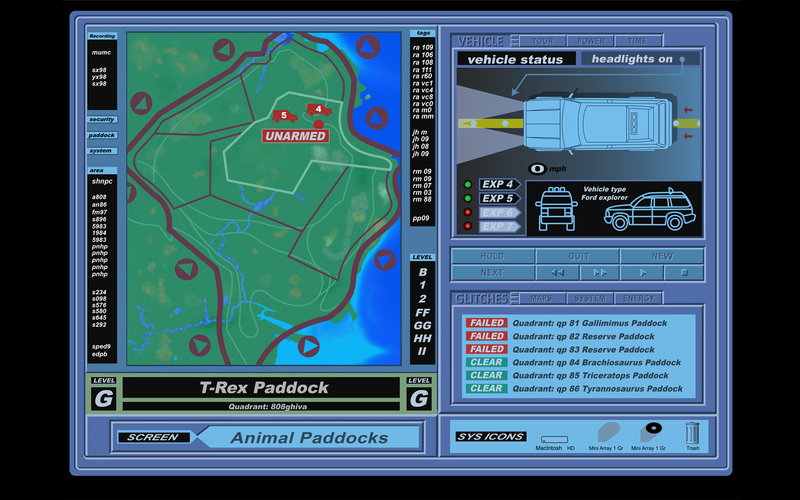 And because I’m supporting the alternative tour path that wasn’t used in the film – I need to add a button that switches what route the car takes!